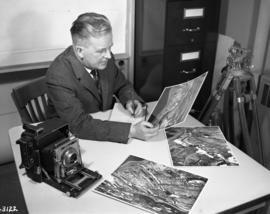 Item is a photograph of A. MacNeil, photographer, working in the photo section. Item is a photograph of A. MacNeil, Edward Larrabee and Jeep Bayko on site at the Fortress of Louisbourg. Item is a photograph of the administrative cleaning staff. Item is a photograph of personnel member Jack drawing a piece of pottery. Item is a photograph of the archaeological staff interpreting stratigraphy on the left flank outside of the King's Bastion (by French drain). Item is a photograph of the archaeological staff interpreting stratigraphy on the left flank outside of the King's Bastion (outside French drain). Item is a photograph of Archaeologist D. MacLeod working in Casemate 3. Item is a photograph of Archaeologist D. MacLeod working on post moulds in Casemate 3. Item is a photograph of archaeologist draftsman J. Akerman. Item is a photograph shot from a casemate R6 which shows an archaeologist at work on the top of the wall, facing South East. Item is a photograph of Senior Historic Archaeologist Edward Larrabee with his dog Bolivier. Item is a photograph of Fortress of Louisbourg personnel assembling stones at the King's Bastion. Item is a photograph of Bert Wreford working on woodcuts. Item is a photograph of the boarding in of a shed in Block 16, facing North. Item is a photograph of Bruce Fry on the counter-escarp. Item is a photograph of Bruce Fry working on a report. Item is a photograph of the South half of the King's Bastion, taken from a bucket. Item is a photograph of building 3Q in foreground, looking along interior of the rampart of left face of King's Bastion toward left flank. Item is a photograph of the building forms that were built to turn the left shoulder angle of the King's Bastion escarp wall. Item is a photograph of personnel building masonry skin on the left flanked angle of the King's Bastion.